VMware Horizon Mobile solution basically enables a user to run a “phone-in-a-phone,” meaning run both work and personal mobile environments separately on the same device. With VMware Horizon Mobile users would be able to have two phone numbers and data accounts on the same smartphone. Note: We are not talking about dual sim phones. Think of it like a partition on a computer hard drive, but in terms of virtualization with far less dedicated space for the work phone, and it’s much easier to toggle between the two user interfaces. The work environment is entirely encrypted and tied to the requirements of the respective enterprise providing the phone number (and possibly the smartphone), but the personal side is unaffected and can download as well as use any apps. If the phone is lost or the employee leaves, the company data on the phone can be remotely wiped. The work phone can also be switched off leaving the personal phone still connected. The trend is powered not only by the growth in mobile devices but also by cloud computing, with companies able to buy ready-to-go virtual desktops. As seen in the screenshots below, the personal phone is truly the main screen with an icon to the “work phone.” One click on that icon takes you to the VMware UI, shown in the second screenshot. The work side takes up less than 1GB of space, and it also allows pre-approved apps (i.e. Salesforce, etc.) from a corporate app store so the users don’t have to worry about more expenses and the configuration. Management of that store as well as the devices can be controlled by IT departments (alleviating some of those bring-your-own-device security worries) in the platform seen below. VMware MVP (VMware Mobile Virtualization Platform)is a thin layer of software that will be embedded on a mobile phone that decouples the applications and data from the underlying hardware. It will be optimized to run efficiently on low-power-consuming and memory-constrained mobile phones. The MVP is planned to enable handset vendors to bring phones to market faster and make them easier to manage. Today handset vendors spend significant time and effort in getting new phones to market due to the use of multiple chipsets, operating systems and device drivers across their product families. The same software stack does not work across all the phones, and therefore, must be ported separately for each platform. This process is slow and expensive and ultimately slows time to market. VMware MVP will virtualize the hardware, enabling handset vendors to develop a software stack with an operating system and a set of applications that is not tied to the underlying hardware. This will enable the vendors to deploy the same software stack on a wide variety of phones without worrying about the underlying hardware differences. At the same time, by isolating the device drivers from the operating system, handset vendors can further reduce porting costs because they can now use the same drivers irrespective of the operating system deployed on the phone. Increasingly, handset vendors and carriers are looking to migrate from proprietary operating systems to rich, open operating systems to enable their customers to access the widest selection of applications. With this transition to open operating systems, protection of trusted services such as digital rights management, authentication, billing, etc. is becoming an increasing concern. VMware MVP will allow vendors to isolate these important trusted services from the open operating system and run them in isolated and tamper-proof virtual machines so that even if the open environment is compromised, the trusted services are not impacted. Companies are under increasing pressure from employees to support employee-owned mobile devices (BYOD). Choice, however, brings with it complexity in managing a wide variety of devices in terms of both cost and security. It also brings increased risk in securing and managing employee-owned devices, especially if they contain confidential information. VMware MVP will allow IT organizations to deploy a corporate phone personality that can run alongside the employee’s personal phone on the same physical device. Smart phones are quickly becoming a combination of a PC and a wallet rolled into one package. A person’s phone persona – an individuals’ collection of applications, pictures, videos, music, emails, bank info, credit card information, PIM, etc. – is becoming much richer and more valuable. Consequently, the ability to protect and migrate personas will become an important purchasing decision. VMware MVP will save the persona as a set of files so that all the applications and data on the phone can be managed as a collection of files. People can then easily move their persona to a new device making the upgrade to a new phone virtually painless. The Mobile Virtualization Platform (MVP) hypervisor allows users to run multiple operating system instances on top of a phone’s physical platform. That means employees can manage a personal and work phone on one device, simplifying life for IT administrators. The Mobile Virtualization Platform essentially creates two usable phones on the same physical device by installing a guest OS in a virtual machine (VM). Because VMware MVP is a hosted hypervisor, you can have two OSes running on the device, resulting in a work environment that is isolated from a user’s personal applications and data. Currently, VMware MVP works only on Android devices. If VMware gets MVP into the Android kernel, you could theoretically run even more than two OSes on the same mobile device. VMware MVP extends an enterprise’s “bring your own device” (BYOD) initiative beyond laptops and tablets to phones. With it, an employer can centrally manage an OS image and isolate corporate applications such as email from apps that users download for personal use, which have the potential to corrupt corporate data. 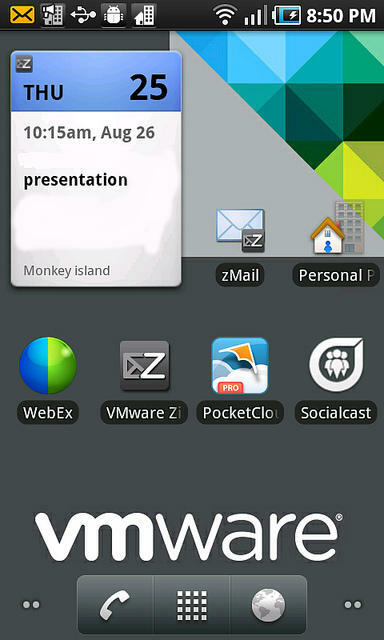 Running VMware MVP makes subtle changes to the Android OS interface. When you look at the Android phone’s notification bar, you’ll see events for two mobile virtualization partitions – both the work and personal data. These appear in different colours to differentiate between the events that occur in each partition. When you respond to a notification, the Mobile Virtualization Platform hypervisor intelligently switches the phone to the appropriate partition and application. The VMware MVP work partition is managed by VMware’s Horizon Mobile Manager, which is currently only offered by Verizon for use by business customers. By using Horizon Mobile, IT departments can provision, manage and cut off mobile devices over a cellular signal. The software also allows managers to push applications to the device and set policies for the corporate profile. That means it’s no longer a huge problem if you lose your mobile device, as the business can easily retrieve corporate data. 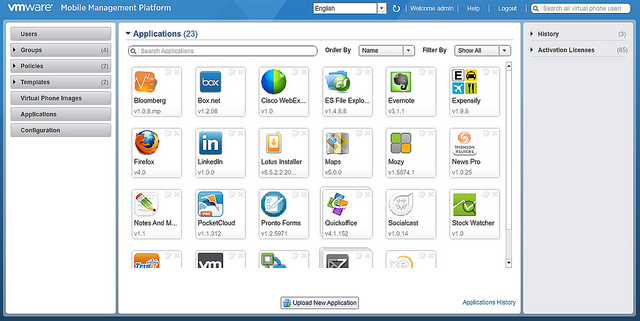 Horizon also allows direct access to Windows applications and Software as a Service tools. 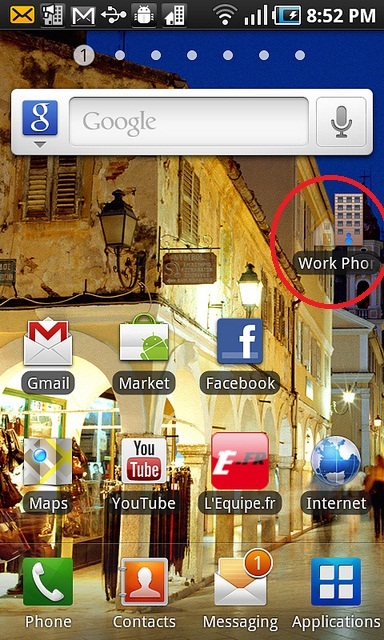 Employees can access a catalogue of corporate-approved applications, which load directly onto the phone’s work profile. There has been substantial manufacturer support for VMware MVP. LG and Samsung both build phones containing VMware’s mobile hypervisor. One of the biggest benefits of developing phones with the Mobile Virtualization Platform is that it makes the devices more attractive to the corporate sector. Still manufacturers will be competing against RIM’s popular BlackBerry mobile devices, which feature a secure enterprise server connection and are very popular in the enterprise. Battery life, as with any smartphone, is always a concern. You are potentially running two full instances of the Android OS to support the VMware MVP environment. Couple that with applications running on separate virtual slices and there are serious concerns as to how long a battery will last. Although the hypervisor itself may be very thin, active users operating multiple apps and running on a 4G network should be prepared for some decreased performance and shortened battery life. At this time, VMware MVP only supports Android devices. To see truly widespread adoption of MVP, VMware will have to get access to Apple’s portion of the smartphone market. But if VMware is developing an Apple iOS implementation, they are probably already aware of Apple’s notorious ability to lock down its OSes. If VMware wants to run the Mobile Virtualization Platform and Horizon Mobile on iPhones, they may need a different strategy with Apple products. It’s well known that Google depends on carriers and phone makers to test, deploy and update users on any OS changes that may occur. So there is sometimes a significant time gap between Google’s updates and when the carriers or manufacturers actually deploy the update. This places VMware in an awkward situation with its Mobile Virtualization Platform. VMware doesn’t have control over Google’s development cycle and won’t know when it needs to push VMware MVP updates to the end user. That means there may be instances when Android phones receive updates and their secondary OS no longer functions. VMware will need to work with Google, the phone manufacturer and the carrier to make sure its mobile virtualization hypervisor is always supported and updated. Reblogged this on Niyaz Shaikh.